Super Hero Boy: Ohhh Christmas Tree! The Berenstain Bears books were a childhood staple when I was growing up, though you don't seem to see as much from them these days the new The Berenstain Bears Christmas Tree release reminded me how much I loved their books as a kid. Each Berenstain Bears episode and book always was about some sort of virtue or lesson. From sharing to manners they always seem to cleverly hide something in the story that makes it fun to learn not so much the way it sounds when parents say it "I told you for the fiftieth time to clean up your room" heh. In the Berestain Bears Christmas Tree the bears bring you five holiday themed episodes. From the Ice Monster where an awful looking ice monster shows up at the winter carnival the town is about ready to get the pitch forks and run him out of town. Looks are not always what they appear and it turns out there is nothing to be afraid of! I have to admit that I find myself guilty of the lesson in The Christmas Tree.. Papa Bear is so focused on finding the absolute best Christmas Tree that he sort of forgets about his family. I really even hate to admit that I am guilty of that but sometimes I tend to get overly excited about getting the best gifts and the best everything that I miss the joy of Christmas all together. Five episodes, five lessons, the Berestain Bears is everything I remember it was and I'm pretty excited to be sharing it with my own son now. The Berestain Bears Christmas Tree is available right now and you can pick up your own copy on Amazon! I have three copies of Berestain Bears Christmas Tree to give away to my readers! Leave a comment on this post. 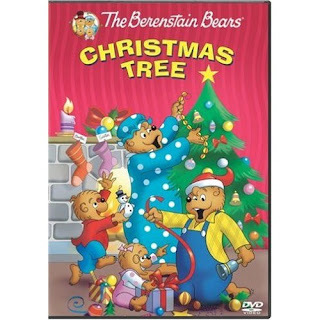 Check out the Berestain Bears Christmas Tree and tell what was your favorite Berestain Bears Book or what you like most about them. This contest will end Dec 15th at midnight! I liked The Berenstain Bears a lot as a kid. I didn't collect them like I did Dr. Seuss or the Disney picture books but I never turned down a chance to read one! I always liked the book about manners and the one about excercising too. I like the Berenstain Bears because they teach our kids good things. I would love to introduce my grandaughters to these cute characters. I love the Berenstain Bears because I remember them fondly from my own childhood in the 70s! I like them because they always teach kids somehing useful, good and practical. I love the lessons that they teach! Strangely enough, I like that the kid bears' names are Sister and Brother. I don't know why, but that cracks me up. My daughter and I love to read the Berenstein Bears. They teach wonderful lessons. we have a lot of the Brenstein bears books in our house! They are so cute and always teach a good lesson! I love everything about the Berenstain Bears, because they are completely non-offensive, and it reminds me of the good, old-fashioned, family entertainment that used to be easy to come by. I would love this book. Growing up my favorite books were the berenstein bears and amelia bedelia. I love the every day little lessons it teaches children. I like that they are good for kids and not like alot of cartoon characters today. We've been reading Berenstain Bears' Moving Day quite a bit lately. We just moved and it helped my little ones sort of get prepared. All my kids have enjoyed the bears and their dad's silliness. I like the way they always pull through as a family. And Mama never seems to lose her cool no matter what Papa does or gets into. My son's favorite book is "Too Much TV"
I loved reading these years ago. I like the messy room one! I like how all their stories cover day to day things most kids go through. The tv show is very sweet too! Oh shoot - I can't think of what the name of it was, but I remember loving one of their books when I was a kid that had to do with being scared of the dark. Easy to learn lessons from watching. Good to watch & fun too. My daughter has a bunch of Berenstain Bears books that were given to her. She loves those books to pieces, literally, because they're so old they're kind of starting to fall apart from us reading them so much. Our favorite is No Girls Allowed. The Berenstain Bears Visit the Dentist is one of my kids' favorites. Papa bear is our favorite character. I enjoyed the Berenstein Bears growing up! Its been so long since I've seen them - I would love to win this so my niece can watch them too! My kids have The Berenstain Bears Home Sweet Tree book and they love it! thanks! This book looks cute The Berenstain Bears: Family and Friendship. Kids need to learn about family and friendship. I loved TBB when I was growing up, and now my kids love them, too. Our fave book is The Berenstain Bears and the Truth. The only story I remember reading when I was little was about them playing jacks...haha it's a great collection! I like The Berenstain Bears and the Truth - good book teaching the importance of telling the truth. I love the lessons they teach and what a good family is all about. Plus they are so darn cute! I like the Berenstain Bears Home Sweet Tree book. I think they are adorable and I really like the illustrations in their books! I love the B Bears Get the Gimmies. I don't know why... Maybe it reminded me of me? I also had an awesome Valentine's Day video on VHS that I loved! You are in the feed list on my blog! I think that i had all of them when I was younger! I would read them all the time! I love the illustrations on them and the stories are great! I remember reading so many of these books to my son and our favorite was Go to School. Get The Gimmies. We have so many of those books. I had Berenstain Bears books for my kids and now they are reading them to their kids. I can't pick a favorite-they liked them all. My favorite Berenstein bears book is Good Manners! I loved them all when I was kid - but maybe the one about how they ate too much junk food and they had to go on a diet. cute characters and great lessons that are easy for the kids to understand. I like how the book teaches lessons to children. We love the Berenstain Bears. My kids have their DVD's which we watch constantly, especially on trips, because they have so many on one DVD. We love their books also: Too Much TV; The Gimmies is a great one. My kids and I love BBears so much because they have bee naround forever and we can always pick up new books for a few nickles at yard sales and such! I loved reading the Berenstain Bears books when I was a kid and I still enjoy reading them today with my daughters, they have a whole collection of these books. My favorite has to be the Berenstain Bears and the Sitter, what a funny book! Thanks for such a great giveaway! Berenstein Bears were my FAVORITE books when I was a kid. I think my favorite would have to be Too Much TV. My kids now love them and watch the tv show EVERYDAY!! My son always check out the Berenstein Bears books ever time we go to the library. One of our favorite is the Bedtime Story. Thanks for the chance to win. I used to have a wierd infatuation with the Berenstein Bear Goes to the Dentist. I can vaguely remember that there was a picture in the book that I found very intriguing but I can't remember it now. Guess I will have to buy that book for my kids so I can jog my memory. I used to love Berenstain Bears Books and now my daughter does. She would LOVE this! I love the Berenstain Bears!! I remember reading their books when I was a little girl and now my son absolutely loves reading about them. The Berestain Bears brings back so many memories. The books were always wonderfully wholesome and fun. I would love to share that with my son now. Thank you. I love the Berenstain Bears books. They are just so loveable. I grew up reading the series as well and it is just wonderful to read your favorite stories to your own children. The characters are adorable and I love that it's all about family. I love the Berenstain Bears. My favorite book is "Lend a Helping Hand". It would be nice to see them back on TV. The Berenstain Bears Think of Those in Need is a favorite here. Thanks for the contest! I like the fact the books always taught manners, good habits, etc., while still being fun. I like that every book has a moral AND an entertaining story! I like them because they teach good family values. I like "TOO MUCH TV" and also the one about Telling the Truth. I would love to have this video! My son is a great fan! I love the Berenstain Bears because it brings back memories from my own childhood. I also like them because it's fun and interesting to kids without being violent or technological in style....both of which I hate. We love the Berestain Bears and the Spooky House book! Thanks for the chance to win! I like them because they teach children lessons in life ,careing ,shareingand I love them from the 70s thanks. I just love how cute they all are and that I can now share them with my daughter. I love the one about the kids' messy rooms. I think my son would love this book! I used to read the berenstein bears all the time when I was a kid! My favorite was "Too Much Junk Food"
I like the one with the Spooky Tree. i like the bears, they are teaching the kids something. I will say my fave is the spooky tree. I love their book when they put on a science fair. It was my favorite and I still have it for my kids. I like the Good Manners one. Like that they are easy enough for one of my kids to read to another. I loved the bears when I was a child and even had a plastic treehouse toy that I pretended was the bears home. I loved the bears when I was little. My favorite book was Too Much TV. I am glad they are still popular because they have a lot of good lessons to teach. Don't they have a cartoon now too? Thanks for the giveaway! I like them because they teach so many good lessons and because my grandchildren really love it when I read these books to them. i like these books because there is always a moral to the story and it teaches children lifes lessons. i use to love these books as a kid. Ironically, one of my favorite stories is "The Berenstain Bears and Too Much TV." I also like the new Christian Berenstain Bears stories out this year published by Zondervan. I loved the Berenstain Bears growing up! I loved their theme song. I liked them growing up because I thought they were funny. I like them for my kids because they are often have great moral lessons that coincides with my family's faith. Your button is in my sidebarand thanks so much! Love the book "The Berenstain Bear's New Baby." It was a great help in acclimating my first granddaughter to the arrival of her baby sister. These books are timeless, and always have a moral to the story. I loved the Berenstain Bairs and the missing Dinosaur Bone. My son's favorite book is Berenstain Bears Trim the Tree that he got last year right before Christmas. I'm sure he'd love this. Thanks for the chance to enter! I'm subscribed via google, thanks! My daughters love the Berenstain Bears. I have handed down the collection of books I had growing up and they have gotten some more to add to the collection. My mother just moved recently and sent a box to me of books for my boys. Well, there were four Berenstain Bears "BIG CHAPTER BOOKS" in there. They were actually my brother's books, but I have been reading them to my boys at night. They LOVE these books. I do believe that they are out of print, but we are on our way to the library today to find more. We just finished Wheelchair Commando. As for my childhood memories of Berenstain, I loved the one where baby sister was born. The family had to move and brother was irritated. Love it! I love the Berenstein bears because I think they teach great values to kids...they're really cute too! The Berenstein Bears teach great values to the children and they are so cute. My daughter loves the Berenstein Bears!! My personal favorite is Berenstein Bears and Good Manners. I remember as a kid that i loved reading their books.I love these guys! I read the Berenstain Bear book to my kids when they were little. They were such wonderful stories that taught good lessons and values. I like the Berenstein bears because I remember watching it as a kid and I like the fact that i can now watch it with my daughter! My favorite when I was a kid was Berenstein Bears Go to the Dentist - It always made me less afraid! Oh wow, since 1960 they have been around. Who doesn't love them? My fav- The Berenstain Bears and Too Much Junk Food! My grandson loves Berenstain Bears Home Sweet Tree book! My kids love The Berenstain Bears Home Sweet Tree . Our favorite is The Berenstain Bears - Bears Mind their Manners. I love the Berenstain Bears because they bring back fond memories of my childhood and because they teach children great things. Papa bear is my favorite. Open trivia question: Does anyone know of any other cartoon family of animal characters,besides the Berenstain Bears, where each family member"s specific name -- like Father,Mother,Sister, Brother --is also their respective familial roles? The Bear Detectives is a classic mystery. My fave was the Berenstain Bears go to Grandma's because growing up I was very shy around my grandparents. i didnt know they made a movie. cool. i loved these books and i love that they all taught something about good morals and values. I will definatly read these books to my son. I like that they remind me of my childhood and that they have such good stories. I'm also subscribed to your RSS feed! My favorite book is the Berenstain Bears Forget their Neighbors. I love the show and the books. They are good for my daughter. I love the family aspect and the lessens learned. I like the Berenstein Bear books because they show love and respect for members of the family, and always have a moral at the end of the book. I like them because they teach so many good lessons. Thanks for the chance to win. I like the lessons they teach. My favorite is the one were brother and sister bear are always wanting something new and mama and papa bear teach them a lesson about the gimmes. Thank you!! My favorite book was the one where Mama is expecting a cub. I got that book, when I was expecting my daughter. My son wanted to read it everynight. I love the Berenstain Bears! I love the fact that they've been around since I was a kid, and the books, well there are so many topics! Its always special when you can share something with your own children/family that you once loved when you were there age! Thanks for entering me. My favorite Berenstain Bears book was the one where Papa Bear goes on a camping trip with his sons scout troop. Naturally, his ideas fail and the son and his scout mates have to save Papa bear. And I am a subscriber. I think I had almost every single Berenstain Bears book when I was growing up. I loved the The Berenstain Bears Prize Pumpkin. I dont really have a particular favorite, I was a big fan of them in the 70s. I even had the board game. I used to have all of these when I was little. I think my favorite was the Go to School book! I loved them when I was little and now my kids do too. I like that they are a good wholesome show for my kids to watch and learn lessons as well. I like the Berenstain Bears Bedtime Battle. Reminds me of my house! I also like the fact the Bears books have first time readers, then beginning readers books so the kids can learn to read with the Bears. Thanks! My daughter's have loved the Berenstein Bears...from "going to the dentist" to "trouble with friends", these books help them get through scary times in their oh so young lives. We are huge fans. Sign me up - my girls would be very excited to win! My favorite book is the Berenstain Bears B Book. It's a great book for teaching the little ones the letter B.
I am a subsrciber also!!! I love the Berenstain Bears they are clean, wholesome and teaches good behavior lesson. The Berenstain bears are wonderful! My family loves them! We love the book on going to the doctors because it takes some of the fear away about getting shots! The bears teach children lots of good things and have been popular for a long time. Thanks for having the contest! My favorite one is A Day At The Race! I forget what it's called, but the one where mama bear cuts open the apples to show baby bear that things aren't always same inside and out. I love that they have good messages in their stories for kids.